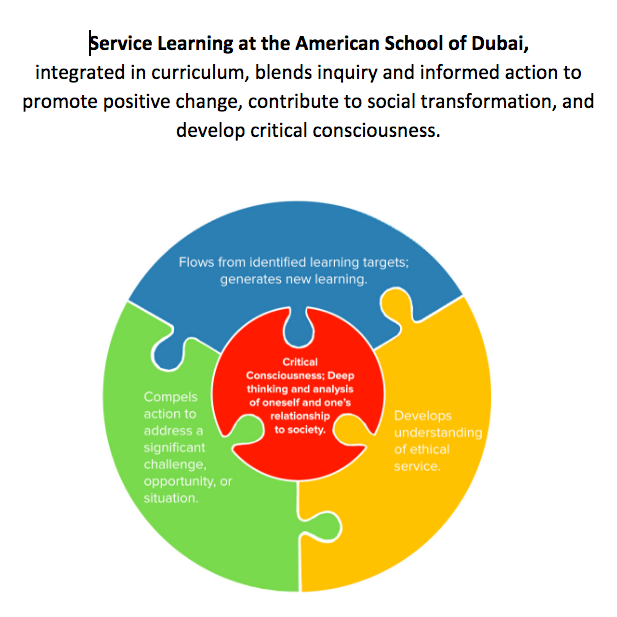 ASD Service Learning: What is Service Learning Anyway? It used to be that "community service" was all the rage. People would walk up to a beach, take out some bags and clean it. Conversations, if any, were short and anecdotal. After the beach was clean they walked away and, with their exit, the trash slowly collected on the beach once again. There is, in actuality, nothing wrong with this picture. After all, what can be better than students doing their part to support their community? But over the years an increasing amount of research has indicated that sometimes what is perceived as service is counterproductive to what it is originally intended for. Enter service learning. The true purpose of service learning is to develop an awareness of self relative to those around us, to develop skills related to becoming a change maker, and to address authentic needs in an authentic manner. it is, by its nature, a systematic approach to developing a service-minded community. At ASD we have lots of great service learning going on and subsequent posts will focus on a variety of them. Increasingly service learning is converging with best practices in teaching because it so well lends itself to inquiry and problem solving. It is excellent for the utilization and development of skills in collaboration, communication, multiple perspectives, creativity and the host of other "21st century skills" that are the focus of current international education. In a nutshell, service learning is a key tool in developing life-long contributors. But perhaps more importantly, it's necessary to recognize that service learning is a shift from service as it was previously practiced. The idea is to no longer simply ask students to clean a beach and leave it at that. The idea is to support student agency through an inquiry of what is on the beach, what that can tell us about the problem, what steps might be followed to address the issue. In short, service learning is real life, hands on, in-your-face learning of the authentic kind. If you look carefully you'll see the school's mission statement written all over that service learning stuff. It's a perfect fit!